2011 was another wild, wonderful year for the YouVersion community. At the beginning of January, the Bible App™ had been installed on almost 13 million unique devices. But by the end of 2011, it had well over 37 million installs. It’s clear that—together—we’re each part of a revolution in Bible engagement happening all over the world. 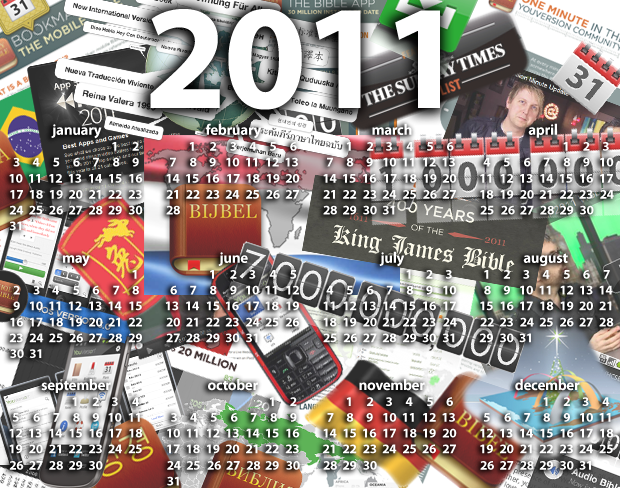 January: We launched 2011 with a challenge to read 1 billion minutes during January, suggesting Bible reading accountability with friends and online, and even offering practical ideas about times to read. The Mashable Awards named YouVersion as a finalist, and the Bible App was named in the all-time top apps on iTunes. February: Although it took 46 days for us to hit one billion minutes, the YouVersion community saw a remarkable 172% reading increase during that time—and also reached more than 5 billion minutes read overall. Volunteers translated the YouVersion experience completely into Chinese, just in time for Chinese Lunar New Year, and the Bible App appeared on the prestigious The Sunday Times’ definitive The App List. March: Three new Reading Plans launched for Lent, just one part of an initiative that saw us more than double overall Reading Plans. Volunteers played a critical role in reaching the world with God’s Word, and for our part, we added new Bible translations. April: Just as the Bible App was installed on its 5 millionth Android device, the Bible App for iOS (iPhone, iPad, and iPod touch) got its largest overhaul since its launch. We made available twice as many versions and almost doubled the number of languages. Rick Warren’s Daily Devotional launched, and we encouraged the community to spend time in God’s Word for Easter. May: Our global flash mob to read the KJV in 400 seconds was so successful that together we read through it… 8 times! A special live webcast celebrated 20 million installs and more than 150 Reading Plans in 10 languages. The brand-new YouVersion Technical Support website launched, and we shared how the community could help. June: People just like you were reaching others through the Bible App, and another story from the YouVersion community encouraged even more to share. The entire YouVersion experience launched in Simplified and Traditional Chinese. YouVersion users together bookmarked more than 20 million Bible passages. July: Russian was the next complete YouVersion language launch, and the YouVersion community shared more stories about how the Bible App continued to change lives. August: The next complete language launch was in Korean. Rewritten from scratch, the all-new Bible App for Windows Phone released with a full feature set comparable to YouVersion’s other major platforms. September: Brazilian Portuguese became the next language to receive the YouVersion-wide experience, and YouVersion celebrated its fourth anniversary. October: The Bible App had been installed on more than 30 million unique devices. The Bible App for Java was completely rewritten, bringing its features more in line with YouVersion’s other platforms, and German became the next complete language launch. November: 7 billion people on Earth represented profound opportunities. Dutch was the tenth complete YouVersion language launch. Joyce Meyer’s Daily Devotional, Promises for Your Everyday Life launched, and a special infographic helped illustrate how much happens across YouVersion during just one minute. A special live webcast covered The Other 16 and YouVersion’s need for more volunteers. December: YouVersion’s next complete language launch was French. The Bible App appeared in iTunes’ “best-of” Rewind 2011, both for iPhone and for iPad, and the YouVersion community completed 1 million Reading Plans. Our annual Global Share the Bible Day tradition continued. Thank you for your part in the YouVersion community’s success during 2011. If you compare this year to last year, it’s immediately apparent that the Bible App and the YouVersion community are healthier than ever. And we’re convinced that it’s still just the beginning. It’s a joy and an honor to get to do what we love… making God’s Word freely available to as many people as possible, no matter where they live or what language they prefer. You can get the newest release of the Bible App™ for Windows Phone right now at Windows Marketplace for Mobile. Version 2.1 of the Bible App for Windows Phone brings more functionality than ever, adding features and settings specifically designed to help you make the most of the time you spend in God’s Word. Audio Bibles. 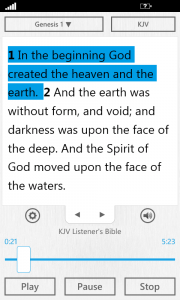 For the first time ever on Windows Phone, now you can listen as the Bible App reads to you through streaming audio, no matter where you are or what you’re doing. (Be aware of the data usage plan for your provider or, for best results, use Wifi.) Listen while you drive, work, exercise—even read along! Audio versions are available in several languages: English, Portuguese, Spanish, Italian, and Chinese (to name just a few). How it works: You can tell if the version you’re reading offers audio if it displays a speaker icon. Simply tap the icon to display controls for playing, pausing, and jumping forward and back within the chapter. If you don’t see the speaker icon, tap the current version’s “short code” (the abbreviation at the top). A list of available versions displays. The versions offering audio have a small speaker beside them. Custom Highlight Colors. 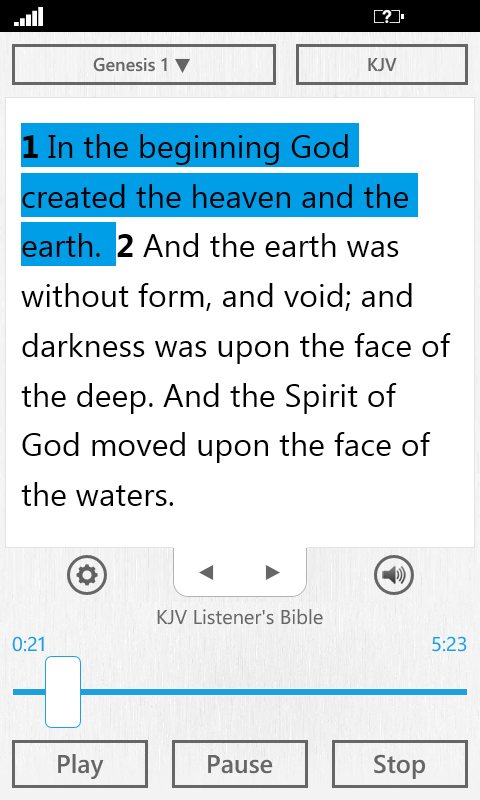 When you sign in to the Bible App on your Windows Phone with a free YouVersion account, you’ll find many of the same features offered by your favorite paper Bible. One great example is highlights. You can use highlights to mark your favorite passages—and even create your own custom highlight colors. Easy Reading. Even on the best mobile devices, sometimes surrounding lighting and screen resolution can interfere with your reading experience. This update of the Bible App for Windows Phone includes tools that help you customize your Reader display for maximum readability. You can change font faces and sizes, and alternate colors between the font and background. How it works: In the Bible Reader, tap the settings icon (the little gear) to display the viewing controls. Tap the sun icon to make the background white and the text black, or tap the moon icon for white text on a black background. Tap the little “A” to make the font smaller, or the larger “A” to make it bigger. Tap the font name for a list of available fonts, then simply tap the one you want. Try experimenting to find the combination that works best for you. Once you get your view how you want, simply tap the settings icon again to hide the viewing controls. The latest update for the Bible App on your Windows Phone is available immediately. If you have friends with Windows Phones, please spread the word and let them know, too. Also, we’d love to connect with you on Facebook and Twitter and hear your feedback. 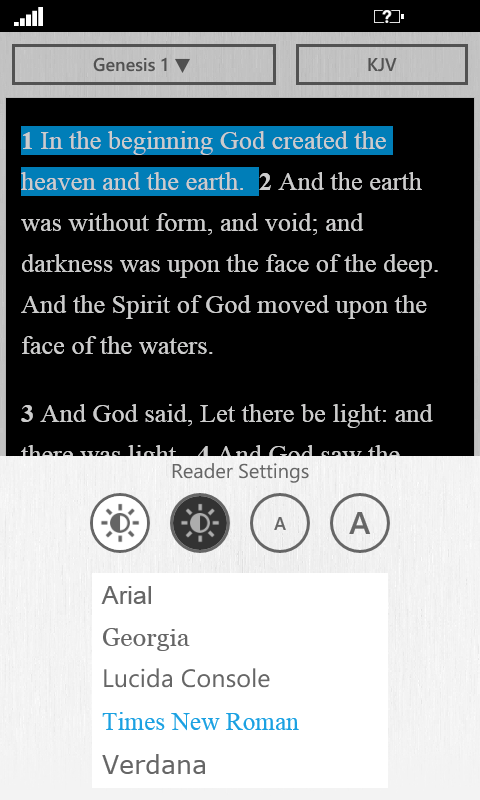 All-New Bible App for Windows Phone! Dashboard – The brand new Dashboard Launcher gives you instant access to the features you use most. Search – Jump quickly to verses or passages based on keywords you enter. Settings – When you sign in to the Bible App with your free YouVersion account, this update now lets you personalize how you use it, and it remembers your unique settings between uses. 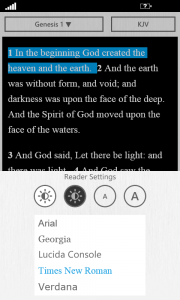 Bible Reader – The Bible Reader keeps track of where you left off, returning you when you come back to the last version, book, and chapter you were reading. And it’s all-new, cleaner and faster loading, designed to make it comfortable for you to read for long periods, in any conditions. Bookmarks – Bookmarks are a great way you can label verses—as many as you want—whether you want to share passages with friends, or simply to jump quickly to your own favorites. Bible Plans – Take full advantage of the more than 150 Bible plans YouVersion has to offer, in 10 languages (so far). Bible plans make it easy for you to read the Bible on a schedule, just a little each day. Get your update to the Bible App for Windows Phone now, and be sure to let us know on Facebook and Twitter what you think! We’ve just released the newest update for the Bible App™ for Windows Phone 7. This latest release, version 1.4, addresses some bugs and performance issues. But the really big news here is the Bible reader. We rewrote the reader portion of the application from scratch to make it more responsive and easier to use. You can get version 1.4 now at the Windows Marketplace for Mobile.